Well I'm back to reality. Reality as in...back to the daily grind of work! My day off yesterday was a fabulous one. My hubby and I had a fabulous time celebrating our 1 year wedding anniversary! We had Old Time Photos taken, lunch, shopping, and a little sight seeing. We were lucky to have amazing weather too. Two thumbs up for our first anniversary! I want to start off my work week this week with a big bang...and by that I mean...Limon. 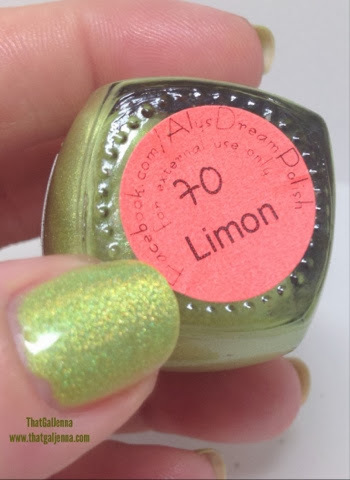 Limon is a super special and crazy color. It packs a HUGE punch. In an awesome way. Look at it! Stare but then avert your eyes due to all the bright! As you can see it really does play both sides of the color spectrum...it appears yellow and green depending on the light and the angle. Limon couldn't be a better name for it. It proved somewhat tricky to really capture the NEON of this...but the photo below really shows the POW it has. There were no color enhancements done on this photo...or any photo I share but I felt like it was necessary to share on this one especially! This is just regular low light indoor light...it SHINES and you can see how it leans yellow. 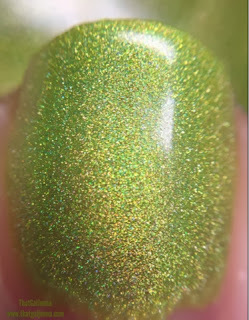 Three thin coats - the less coats the more yellow you'll get - for me three coats was complete opacity. Come on...just look at it. 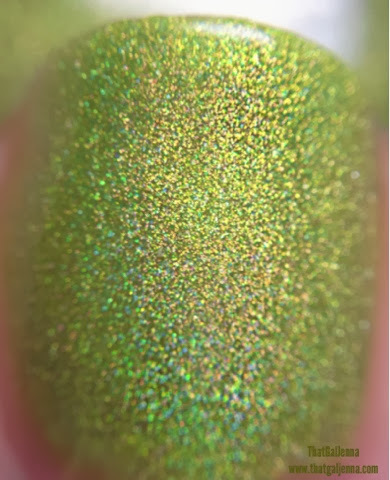 It will be more holo in natural light and when there is sun in said natural light. At other times it'll be much less neon it'll just be bright. It'll lean green...it'll lean yellow...but it'll always be holographic and fabulous. This is such a unique and lively polish. Just wait until you have it on your paws! Don't forget to hit up all the Aly's hot spots! I've obviously never met an Aly's I don't love! Do you have a favorite? Are you new to Aly's? A veteran Aly's fan? Do you have any on your ISO for the next schedule pre-order?? Come by tomorrow for this weeks installment of What I Wore Wednesday!